If Facebook Home was one of my friends, I’d be breaking out the ice cream and letting her cry on my shoulder right about now. She just had her coming-out party and basically got rejected from most of the people who danced with her. Facebook Home landed in the Google Play Store on Friday, but after only a few hours, the app launcher and home screen already garnered some pretty harsh reviews. How bad? At 5:03 p.m. PST that day, just 533 users out of a total of 1,289 gave it three stars or more, while 756 people rated it at one or two stars. And of those bottom tiers, 585 of them were for a single measly star. Looks a little bottom-heavy, doesn’t it? 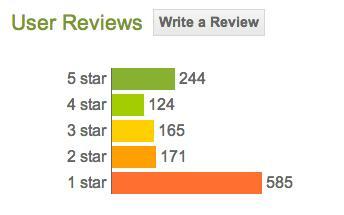 Those numbers average out to 2.4 stars — well below Facebook’s other entries. Its full-fledged official app has a score of 3.6, and Facebook Messenger reigns at 4.4. Strangely enough, it was actually doing worse earlier, when The Next Web noted it had a 2.3 average star rating. Complaints varied. Some were disappointed with the lack of widgets or folders, while others didn’t appreciate the overwhelming dominance of the new home screen. In some cases, it was just a general dislike of the interface. On the other end of the haters were Facebook fiends who loved having their updates and feeds so accessible in such a fluid way. So is Facebook Home a flop? Well, it depends on what kind of user you are. As one reviewer said, “If you’re life revolves around Facebook (think teens or soccer moms), then you will probably love this.” And that may be true, that is, if you don’t mind giving up widgets, folders and other custom settings. You know — all the stuff that makes Android…well, Android. Friday, HTC and AT&T also released the HTC First, the smartphone that comes with the Facebook Home app-skin pre-loaded. The specs and early reviews cement everything we already knew about this device. It’s a mid-tier phone that doesn’t really excel at anything. But its foibles — like middling battery life and lackluster responsiveness — aren’t so horrible that they’re total dealbreakers, especially for bargain smartphone hunters whose first priority is Facebook, and want it front and center.